Before the feast: While you’re watching football and enjoying a few apps, crack open a Hoppy Place or X-Ray Specs Red Rye IPA to pair with cheeses, salty snacks and spicy favorites. Our Alpha Ox Hoppy Pale Ale offers a low ABV alternative. The Grand Feast: Golden Ox is a turkey’s best friend. Rich malts and spice give this Golden Ale the complexity needed to stand up to the rich flavors on the Thanksgiving table. 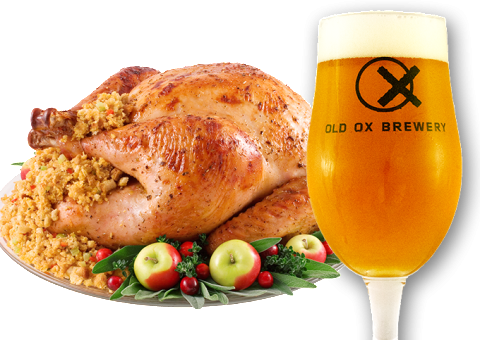 Our Oxtober Bier is also very turkey friendly. Pick up a growler or two in the tasting room. The Grand Finale: Pumpkin pie and Black Ox make excellent dessert companions. Taste alert: If you are serving a pumpkin roll or other dessert that features cream cheese, try pairing it with one of our IPAs—a delicious surprise for your family and friends. 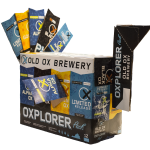 Bring an Old Ox Variety Pack to your hostess and you’ll have all the Thanksgiving beers you need. Sip Alpha Ox and Red Rye IPA during happy hour. The Golden Ox pairs well with the savory feast. Pair Black Ox with your pumpkin or pecan pies … or even chocolates! Our tasting room is open from 1:00 to 8:00 p.m. on Wednesday, November 21 for your Thanksgiving growler fills and cans of specialty beers.